The Raffles Place, Tanjong Pagar/ Maxwell and Robinson/Shenton areas are dominated by older office buildings, unlike the Marina Bay CBD extension which was planned as a mixed-use district, he added, noting most eligible buildings have already made use of the scheme. Mr Wong also noted plans to revamp Orchard Road, like having different precincts with more diverse offerings, to make the stretch "one of the great streets of the world". In reply to Nominated MP Walter Theseira, who felt that favouring private development over public use for high-value areas would worsen social stratification, he said the Government also intends to continue "injecting public housing" in central areas. "We have already been doing so in small pockets and we will plan to do so in a bigger way with long-term rejuvenation." Mr Wong said getting the balance right would be difficult: Pricing new HDB flats in prime areas according to market value would see only the well-off get them, but giving huge discounts may lead to a "lottery effect" when owners sell their flats. "The lucky guy who gets the flat gets a so-called windfall, compared to others who buy flats elsewhere. Then it's not a fair distribution of housing subsidies," he said. The long-term solution is to ensure that every town is well-developed, with good amenities and convenient access to transport nodes and job centres near home, he said. While these efforts do not "automatically equalise property values", the Government can "temper some of the excesses in the market". Mr Wong also highlighted plans for three major gateways in the east, west and north of the island. These key developments will help create more jobs and increase opportunities for Singaporeans to work closer to their homes. Meanwhile, work to redevelop the 800ha Paya Lebar Air Base site, which is bigger than Ang Mo Kio town, will start after 2030. Work on the Greater Southern Waterfront will start sooner, in the next five to 10 years. The project over 2,000ha of prime waterfront land - six times Marina Bay's size - will span more than 20 years. Added Mr Wong: "Over time, we will redevelop and stitch together the entire waterfront from Pasir Panjang to Marina East." 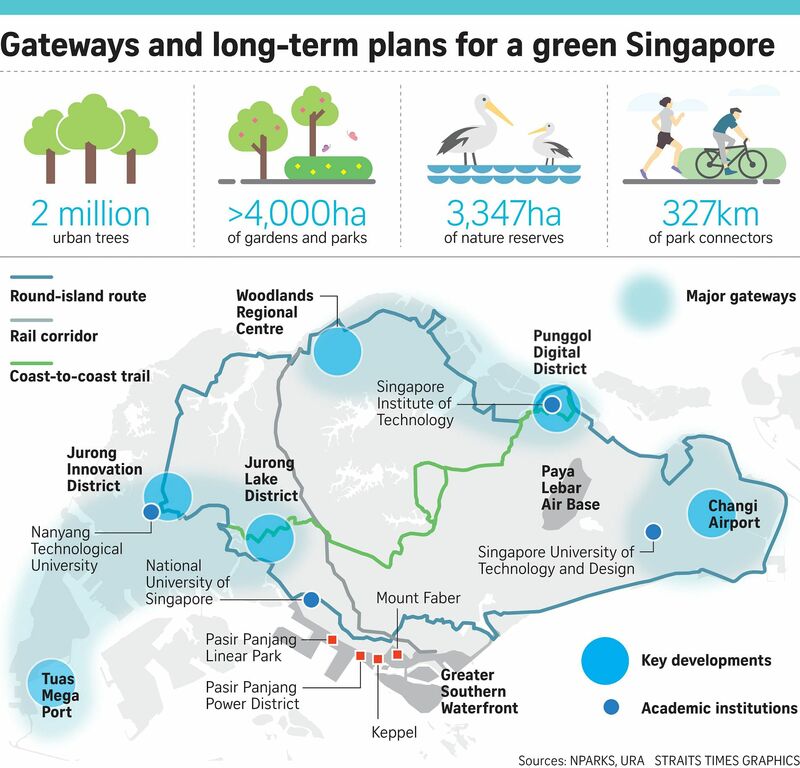 Calling climate change an existential threat, he said the risks and impact of sea level rise have been studied carefully and the Government is looking at detailed measures to protect Singapore's coastal areas. These may include reclamation, sea walls or pumping stations. "These are long-term investments, but we are preparing well ahead and putting in place the necessary protective measures within the next 20 to 30 years," he said. The Urban Redevelopment Authority will launch the draft Master Plan 2019 exhibition later this month for public feedback, he said. The plan, reviewed every five years, guides development over a 10-to 15-year time frame.